211 Bernard: Susceptible in the Montreal Gazette! Susceptible in the Montreal Gazette! "Susceptible charts the thorny path from confusion to hard-won wisdom as only the best fiction can, building up to an ending that’s genuinely moving. The world would be a richer place if even a fraction of the Twilight masses tuned in to books like this one, books that show young people groping toward a sense of identity through narratives that unfold in the world of real cause and effect, without leaning on fantasy. Awkward girls — and their guy counterparts, and anyone who remembers what it was like to be either — will have a friend in Goglu." 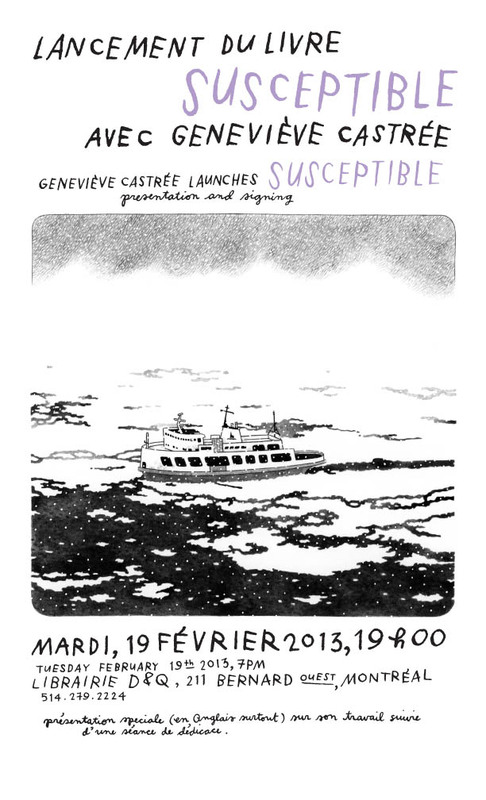 Lucky human that I am, I've gotten a preview of Geneviève's presentation, and it's going to be A-W-E-S-O-M-E, so seriously dudes, come on out. Wine, beautiful art, and good stories. What more does a soul need on a dreary February evening? Tuesday February 19th, 7 pm, 211 Bernard O!